On May 5, 2017, TIAG hosted a Member Award and Recognition Ceremony to honor its most longstanding member firms. 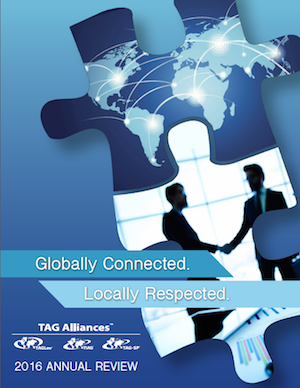 The ceremony took place during the TAG Alliances Spring International Conference in Paris, France and recognized eight founding members in attendance. Established in 1954 as Messers Daudally & Co. the firm specializes in the areas of Audit and Assurance, Taxation, Advisory, Consulting and Corporate Affairs. Since incorporation, the firm has up held a high standard of excellence in providing professional services to organizations ranging from SMEs and individual entities to large corporate enterprises. The firm is compliant with Quality Control Review (QCR) by The Institute of Chartered Accountants of Pakistan (ICAP). It is also on auditors panel of State Bank of Pakistan (SBP), Karachi Stock Exchange (KSE), Pakistan Commodity Exchange Limited (PMEX), Federal Board of Revenue (FBR), and Sales Tax Department of FBR. TAGLaw®, the sister alliance of TIAG® (The International Accounting Group), was recently recognized by Chambers & Partners as “Elite” for 2017—the highest ranking awarded to legal networks and alliances. This is the fourth time TAGLaw has received the “Elite” designation since Chambers & Partners began ranking legal networks and alliances in 2013. APC Constantinou Ltd is a boutique Tax, Audit and Business Advisory organization which has evolved into a successful firm by offering focused, specialized services to its niche sectors. As a leading local firm with over two decades of experience, APC offers tax, audit and business consultancy to an international clientele, providing high quality support to international cross-border businesses.Guided by the core values of competence, integrity, respect and value, APC operates with the fundamental philosophy that every client deserves exceptional, timely service from knowledgeable professionals.